TUESDAY, Jan. 16, 2018 (HealthDay News) — President Donald Trump is in excellent physical health and also shows no signs of age-related cognitive decline, according to a detailed briefing Tuesday following his annual check-up. “All clinical data indicates that the president is currently very healthy and that he will remain so for the duration of his presidency,” Rear Admiral Dr. Ronny Jackson, the official Physician to the President, said during the news briefing. The annual four-hour medical exam took place Friday and involved 12 specialty consultants, Jackson noted. He added that none of the results of the exam had been omitted from mention at the news briefing. Jackson — who also oversaw former President Barack Obama’s checkups beginning in 2013 — in particular praised Trump’s cardiac health. He said the 71-year-old president displayed strong results during both an electrocardiogram and an exercise stress test. 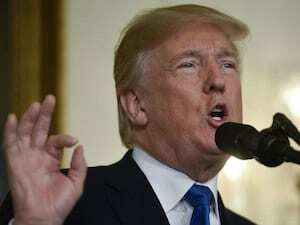 Trump also received a perfect score (30/30) on the Montreal Cognitive Assessment (MoCA) — a standard, one-page test designed to test a person’s thinking and memory skills for signs of dementia, Jackson said. Trump specifically asked to be screened for dementia, even though such a test is not recommended at his age, Jackson said. Recent news reports of Trump slurring his speech and repeating stories have raised speculation about his mental fitness. Physically, Trump is borderline obese (6 foot, 2 inches tall and 239 pounds), and his cholesterol levels are borderline high (143 LDL “bad” cholesterol), according to the vitals reported by Jackson. But that’s not a huge surprise given the president’s affinity for McDonald’s and distaste for exercise. The president has also noted that he sleeps only about 4 to 5 hours per night, and Jackson confirmed that. However, given those lifestyle habits, Trump is still much healthier than many men his age, the report suggests. That could be due to two factors, Jackson said. First, he’s never smoked, nor has he been even a social drinker, the physician noted. “He continues to enjoy the significant long-term cardiac and overall health benefits that come from a lifetime of abstinence from tobacco and alcohol,” Jackson said. And secondly, Trump appears to have won the genetic lottery when it comes to healthy aging. As a result, the president can boast a reasonable 122/74 blood pressure and solid circulatory and respiratory health, Jackson said. In response to media questions, Jackson clarified that the MoCA test only assesses cognitive health — it cannot judge any psychiatric conditions the president may or may not have. And although the president can lay claim to generally good health, improvements could be made. To that end, Jackson will be working with the president to establish a regular exercise program, and will bring in dietitians to consult with White House chefs on healthier meals. Trump also will increase his daily dosage of Crestor, Jackson said, with a goal of getting his LDL cholesterol down to below a reading of 120. The president’s current roster of medicines includes a daily multivitamin; 10 milligrams of Crestor for his cholesterol; 81 milligrams of low-dose aspirin daily to help maintain heart health; and 1 milligram of Propecia for male pattern baldness, Jackson said. For more on healthy aging, visit the U.S. National Institutes of Health.